Nontronite: Mineral information, data and localities. Named in 1827 by Pierre Berthier for the type locality at Nontron, Dordogne, France. Originally named chloropal in 1822 by Dr. Johann Jakob Bernhardi and Dr. Rudolph Brandes for chlor- and opal suggesting it was a green waxy mineral somewhat resembling common opal. Pyrite 25 photos of Nontronite associated with Pyrite on mindat.org. Chabazite 22 photos of Nontronite associated with Chabazite on mindat.org. Calcite 18 photos of Nontronite associated with Calcite on mindat.org. Analcime 14 photos of Nontronite associated with Analcime on mindat.org. Baryte 12 photos of Nontronite associated with Baryte on mindat.org. Chalcedony 10 photos of Nontronite associated with Chalcedony on mindat.org. Hollandite 8 photos of Nontronite associated with Hollandite on mindat.org. Thomsonite 7 photos of Nontronite associated with Thomsonite on mindat.org. Opal 7 photos of Nontronite associated with Opal on mindat.org. Mesolite 5 photos of Nontronite associated with Mesolite on mindat.org. 71.3.1a.1 Beidellite (Na,Ca0.5)0.3Al2((Si,Al)4O10)(OH)2 · nH2O Mon. Berthier, P. (1827) Nontronite, nouveau minéral découvert dans le département de la Dordogne. Annales de Chimie et de Physique: 36: 22-27. Larsen, E.S., Steiger, G. (1928) Dehydration and optical studies of alunogen, nontronite, and griffithite. American Journal of Science, 5th. series: 15: 1-19. Foshag, W.F. (1928) New mineral names. American Mineralogist: 13: 491-494. Goodman, B.A., Russell, J.D., Fraser, A.R. and Woodhams, F.W.D. (1976) A Mössbauer and infrared spectroscopic study of the structure of nontronite. Clays and Clay Minerals: 24: 53-59. Russell, J.D. and Clark, D.R. (1977) The effect of Fe-for-Si substitution on the b-dimension of nontronite: Clay Minerals: 13(2): 133-137. Goodman, B.A. (1978) The Mössbauer spectra of nontronites: consideration of an alternative assignment. Clays and Clay Minerals: 26(2): 176-177. Russell, J.D. and Clarke, D.R. (1978) The effect of Fe-for-Si substitution on the b-dimension of nontronite. Clay Minerals: 13: 133-137. Tsipursky, S.I., Drits, V.A., and Chekin, S.S. (1978) Study of structural ordering of nontronite by oblique texture electron diffraction. Izvestiya Akademii Nauk SSSR, Seriya Geologicheskaya: 10: 105-113. [in Russian]. Besson, G., Bookin, A.S., Dainyak, L.G., Rautureau, M., Tsipursky, S.I., Tchoubar, C., and Drits, V.A. (1983) Use of diffraction and Mössbauer methods for the structural and crystallochemical characterizations of nontronites. Journal of Applied Crystallography: 16: 374-383. Der Aufschluss (1983) 34: 295. Dainyak, L.G. and Drits, V.A. (1987) Interpretation of Mössbauer spectra of nontronite, celadonite, and glauconite. Clays and Clay Minerals: 35: 363-372. Sherman, D.M. and Vergo, N. (1988) Optical (diffuse reflectance) and Mössbauer spectroscopic study of nontronite and related Fe-bearing smectites. American Mineralogist: 73: 1346-1354. Lear, P.R. and Stucki, J.W. (1990) Magnetic properties and site occupancy of iron in nontronite. Clay Minerals: 25: 3-13. Murad, E., Cashion, J.D., and Brown, L.J. (1990) Magnetic ordering in Garfield nontronite under applied magnetic fields. Clay Minerals: 25: 261-269. Köster, H.M., Ehrlicher, U., Gilg, H.A., Jordan, R., Murad, E., and Onnich, K. (1999) Mineralogical and chemical characteristics of five nontronites and Fe-rich smectites. Clay Minerals: 34: 579-599. Manceau, A., B. Lanson, B., Drits, V.A., Chateigner, D., Gates, W.P., Wu, J., Huo, D., and Stucki, J.W. (2001) Oxidation-reduction mechanism of iron in dioctahedral smectites. I. Crystal chemistry of oxidized reference nontronites. American Mineralogist: 85: 133-152. Dainyak, L.G., Zviagina, B.B., Rusakov, V.S., and Drits, V.A. (2006) Interpretation of the nontronite-dehydroxylate Mössbauer spectrum using EFG calculations. European Journal of Mineralogy: 18: 753-764. Gailhanou, H., Blanc, P., Rogez, J., Mikaelian, G., Horiuchi, K., Yamamura, Y., Saito, K., Kawaji, H., Warmont, F., Grenèche, J.M., Vieillard, P., Fialips, C.I., Giffaut, E., and Gaucher, E.C. (2013) Thermodynamic properties of saponite, nontronite, and vermiculite derived from calorimetric measurements. American Mineralogist: 98: 1834-1847. Bogdanov, Y.A., Vikent’ev, I.V., Lein, A.Y., Bogdanova, O.Y., Sagalevich, A.M., and Sivtsov, A.V. (2008): LGeology of Ore Deposits 50(2), 119-134. Ashley, P.M., and Willott, B.R. (1997): Mineralium Deposita 32, 16-33. England, B.M. (1984) The paragenesis of contrasting habits of calcite and aragonite-calcite associations from Kulnura, New South Wales, Australia. Mineralogical Magazine, 48:448, 519-527. England, Brian M., "An Occurrence of Manganoan Siderite at Woy Woy, Central Coast of NSW", Australian Mineralogist July 1987, pp 5-8. Eggleton, R.A., Fitzgerald, J., and Foster, L., 2011. Chrysoprase from Gumigil, Queensland. Australian Journal of Earth Science. 58, 767-776. Noble R.J., Just J. and Johnson J. E., (1983), Catalogue of South Australian Minerals-1983, Government Printer, Adelaide, South Australia. ; Grguric, B., Pring, A. & Drew, G. (1994), "The Burra Burra mine, Burra, South Australia", Mineralogical Record, vol. 25, no. 2, pp. 121-129. Gibson, C. G. (1906) The Laverton, Burtville, and Erlistoun Auriferous Belt, Mt. Margaret Goldfield. Western Australia Geological Survey Bulletin 24. Simpson, E.S. (1948), Minerals of Western Australia, Vol 3, p 306 (assumed to be Banego Erilstoun in Simpson). Pirajno, F., Burlow, R. and Huston, D. (2010): The Magellan Pb deposit, Western Australia; a new category within the class of supergene non-sulphide mineral systems. Ore Geology Reviews 37, 101-113. Piso, E. (1970): Zusammensetzung und Genese der Basalte des Pauliberges und von Stoob-Oberpullendorf (Burgenland). 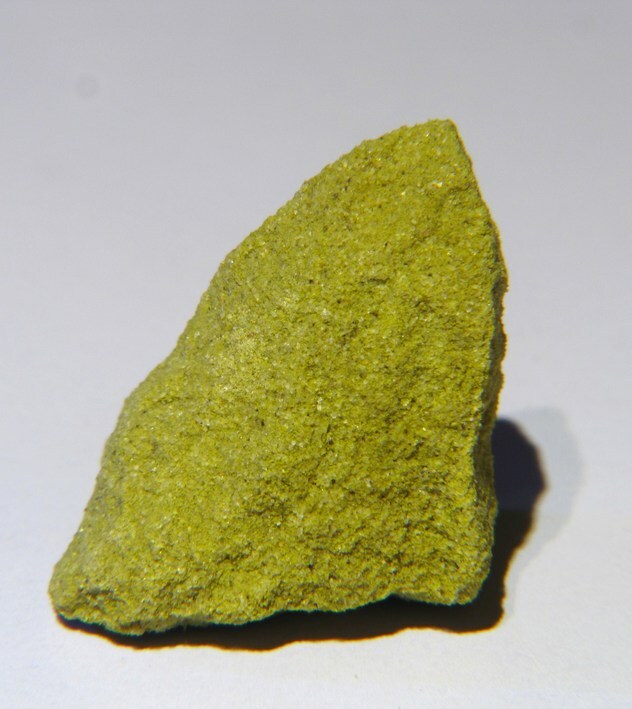 Tschermak's Mineral. Petrogr. Mitt. 14, 103-139. BECKE F. (1917): Graphit im niederösterreichischen Waldviertel. Tscherm. mineral. petrogr. Mitt. N. F. 34 (Mitt. Wiener Mineral. Ges. 80): 58-64. HOFBAUER, Richard (1962): Neue Graphitbergbaue im niederösterreichischen Waldviertel.- Montan-Rdsch., 10/4, 82-84, Wien. GÖTZINGER, Michael A. (2008): Mineralogie und Mineralvorkommen des Waldviertels.- In: STEININGER, Fritz F. (Hrsg. ): Waldviertel - Kristallviertel. Die steinerne Schatzkammer Österreichs - Gesteine und Mineralien des Waldviertels, Schriftenr. Waldv. Heimatb., 49, 77-99, Horn. Carinthia II, 196./116. (2006) 121-157. Taucher, J. & Hollerer, C. E. (1998): Minerale eines Si- und Al-reichen Xenoliths aus dem Basaltsteinbruch von Klöch, Nördlicher Bruch, (Steiermark, Österreich). Mitt. naturwiss. Ver. Steiermark 128, 21-42. Bonev, I.K. (1993) Non-equilibrium highly anisometric crystals and whiskers of galena. Mineralogical Magazine, 57 (issue 387), 231-240. Lambert, R.J., and Noble, A.C. (2008): Nkamouna Cobalt Project Feasibility Study. Pincock, Allen & Holt NI 43-101 Technical Report for Geovic Mining Corp.
Petruk, W., Farrell, D. M., Laufer, E. E., Tremblay, R. J., & Manning, P. G. (1977). Nontronite and ferruginous opal from the Peace River iron deposit in Alberta, Canada. The Canadian Mineralogist, 15(1), 14-21. HORVÁTH, L. and HORVÁTH-PFENNINGER, E. (2000) Die Mineralien des Mont Saint-Hilaire. Lapis, 25, Nr. 7/8, 23-61 (in German). ; HORVÁTH, L., PFENNINGER‑HORVÁTH, E. (2000) I minerali di Mont-Saint-Hilaire (Québec, Canada) Rivista Mineralogica Italiana, XXIV, 140-202 (in Italian with English summary). Kaiji Yu (1981): Geology and Prospecting 17(1), 19-25 (in Chinese). Lazarenkov, V.G., Tikhomirov, I.N., Zhidkov, A.Y., and Talovina, I.V. (2005): Lithology and Mineral Resources 40(6), 521-527. Adamides, N. G. (2010). Mafic-dominated volcanogenic sulphide deposits in the Troodos ophiolite, Cyprus Part 1–The deposits of the Solea graben. Applied Earth Science, 119(2), 65-77. Pelíšek J.: Některé nové minerály v krystalických vápencích moravika. Časopis pro mineralogii a geologii, 1979, 24, 4, 435-346. Pelíšek, J.: Ni-nerosty v serpentinitu západní Moravy. Časopis pro mineralogii a geologii, 1987, roč. 32, č. 2, s. 207. Torio-Henríquez, E. (2007) Petrography and mineral alteration in Berlin geothermal field. Proceedings, Thirty-Second Workshop on Geothermal Reservoir Engineering. Stanford University, Stanford, California, January 22-24. Chukanov, N., Ermolaeva, V., Pekov, J. and Lahti, S. 2009. Carbonaceous matters in pegmatites of different genetic types and their role in fprmation of mineral associations. New Data on Minerals Vol 44..
Walenta, K. (1992): Die Mineralien des Schwarzwaldes. Chr. Weise Verlag, München, 336 pp. (in German); KOLITSCH, U. 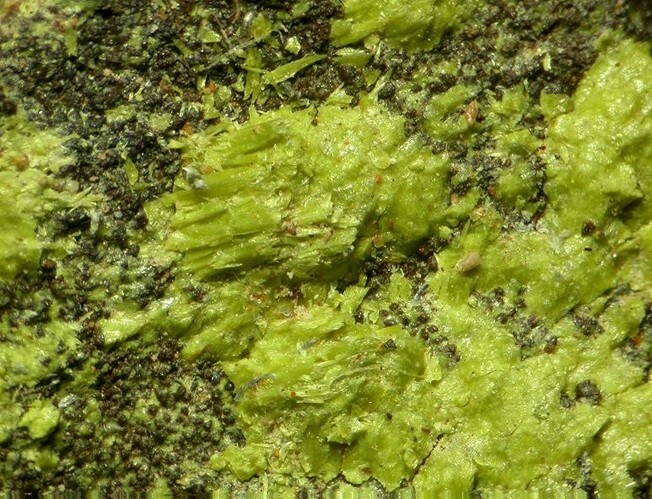 & GÖTZINGER, M. (2000): Einige Neufunde aus der Grube Clara im mittleren Schwarzwald: Eulytin, Namibit, Volborthit, Gearksutit, Spertiniit, Monazit-(La), Protasit, Sainfeldit, Cyanotrichit und Vauquelinit. - Erzgräber 14, 33-47. Meier, S. & Dünkel, B. (2010): Das Zinn- und Uranbergwerk am Rudolfstein bei Weißenstadt, Fichtelgebirge. Lapis 35 (2), 29-37; 54. Goodman, B.A. (1978) The Mössbauer spectra of nontronites: consideration of an alternative assignment. Clays and Clay Minerals: 26(2): 176-177.; Murad, E., Cashion, J.D. and Brown, L.J. (1990) Magnetic ordering in Garfield nontronite under applied magnetic fields. Clay Minerals: 25: 261-269. Keck, E. (2010): Zwei neue Harmotomvorkommen aus dem Kemnather Vulkanfeld in der Oberpfalz. Aufschluss 61, 261-269. Goodman, B. A., Russell, J. D., Fraser, A. R. and Woodhams, F. W. D. (1976) A Mossbauer and infrared spectroscopic study of the structure of nontronite. Clays & Clay Minerals 24, 53-59. Köster, H.M. (1960): Contributions to Mineralogy and Petrology 7, 71-75. Witzke, T. & Giesler, T. (2012): Fayalit, Cristobalit, Tridymit und Grunerit aus dem Königshainer Granit, Lausitz. Aufschluss, 63 (6), 301-307. Polgári, M., Hein, J. R., Németh, T., Pál-Molnár, E., & Vigh, T. (2013). Celadonite and smectite formation in the Úrkút Mn-carbonate ore deposit (Hungary). Sedimentary Geology, 294, 157-163. Ali Abedini, Ali Asghar Calagari (2016): Geochemical characteristics of the Arabshah kaolin deposit, Takab geothermal field, NW Iran. Arabian Journal of Geosciences 9, 548. Dill, H. (1979): Lagerstättenkundliche Untersuchungen zur Entstehung der Pyrit-führenden Blei-Kupfer-Zink-Lagerstätte Accesa (SW-Toskana). Mineral. Deposita 14, 57-80. Dekov, V. M.; Kamenov, G. D.; Stummeyer, J.; Thiry, M.; Savelli, C.; Shanks, W. C.; Fortin, D.; Kuzmann, E.; Vertes, A. (2007) - Hydrothermal nontronite formation at Eolo Seamount (Aeolian volcanic arc, Tyrrhenian Sea). Chemical Geology, 245, 103 – 119. Assaoulé Benjamin Allou (2005) Facteurs, Paramètres, Dynamique DE Distribution Et Genèse Des Dépôts DE Columbo-tantalite D'issia Centre-ouest DE LA Côte D'ivoire. PhD thesis, University of Quebec. Masaaki Shimizu and J. Toshimichi Iiyama (1982) Zinc-lead skarn deposits of the Nakatatsu Mine, central Japan. Economic Geology 77, 1000-1012. Besaire, H. (1961) Les ressources minérales de Madagascar. Annales Géologigues de Madagascar, 30: 116p. Von Bezing, L., Bode, R., and Jahn, S., (2008) Namibia Minerals and Localities. Edition Schloss Freudenstein, Bode Verlag GmbH, Haltern. 331 (in English). Rae, A.J. (2007) Rotokawa geology and geophysics. GNS Science consultancy report 2007/83. Confidential Report, 11 pages. Hynek, B. M., McCollom, T. M., Marcucci, E. C., Brugman, K., & Rogers, K. L. (2013). Assessment of environmental controls on acid‐sulfate alteration at active volcanoes in Nicaragua: Applications to relic hydrothermal systems on Mars. Journal of Geophysical Research: Planets, 118(10), 2083-2104. Astakhov, A. S., Tiedemann, R., Murdmaa, I. O., Bogdanova, O. Y., Mozherovsky, A. V., & Sereda, N. A. (2006). Manganese carbonates in the upper Quaternary sediments of the Deryugin Basin (Sea of Okhotsk). Oceanology, 46(5), 716-729. Kuhn, B., Zimmermann, E. (1918) Erläuterungen zur geologische Karte von Preussen und benachbarten Deutschen Ländern. Blatt Schönau an der Katzbach. Lieferung 202. Königlich-Preussische Geologische Landesanstalt, Berlin. Glass, J. (2006). The environmental impact of the abandoned Edendale lead mine near Tshwane, South Africa (Doctoral dissertation, University of Johannesburg). Persson, Anders (1999) Brattåsgruvan. Beskrivning av Vittenstens koppargruva, Eda Komun. Upublished paper. 2p. M. Delaloye (1966): Contributation à l'étude des silicates de fer sédimentaires Le gisement de Chamoson (Valais). in: Schweizerische Geotechnische Kommision. Beiträge zur Geologie der Schweiz: Geotechnische Serie. Die Eisen- und Manganerze der Schweiz 13.9. Le gisement de Chamoson (Valais). Andermatt, P.J. (2010): Mineralogie im Steinbruch Holcim in Eclépens. Schweizer Strahler, 44 (3), 2-6 (in German and French). Masurenko, C., and Tanaskovic, D. (2007), In: Andrew, C.J. et al. (eds. ): Proc. 9th Biennial SGA Meeting, Dublin (Ireland), August 20-24, 2007. Stephen, I. (1954) An Occurrence of Palygorskite in the Shetland Isles. Mineralogical Magazine, vol. 30, n° 226, pp. 471-480.; Livingstone, A. and Macpherson, H.G. (1983) Fifth Supplementary List of British Minerals (Scottish). Mineralogical Magazine, vol. 47, n° 342, pp. 99-105.; Livingstone (2002) p. 176. Anthony, J.W., et al (1995), Mineralogy of Arizona, 3rd.ed. : 176. Anthony, J.W., et al (1995), Mineralogy of Arizona, 3rd.ed. : 314; Schwartz, G.M. (1947), Hydrothermal alteration in the 'porphyry copper' deposits, Econ.Geol. : 42: 319-352. Granger, H.C. & R.B. Raup (1959), Uranium deposits in the Dripping Spring Quartzite, Gila Co., AZ, USGS Bull. 1046-P: 442. Anthony, J.W., et al (1995), Mineralogy of Arizona, 3rd.ed. : 314; Granger, H.C. & R.B. Raup (1969), Geology of Uranium Deposits in the Dripping Spring Quartzite, Gila Co., AZ, USGS PP 595. MRDS database Dep. ID #10027327, MRDS ID #002877. Anthony, J.W., et al (1995), Mineralogy of Arizona, 3rd.ed. : 314; Schwartz, G.M. (1947), Hydrothermal alteration in the 'porphyry copper' deposits, Econ.Geol. : 42: 319-352; Schwartz, G.M. (1958), Alteration of biotite under mesothermal conditions, Econ.Geol. : 53: 164-177; Galbaith, F.W. & D.J. Brennan (1959), Minerals of AZ: 110. Anthony, J.W., et al (1995), Mineralogy of Arizona, 3rd.ed. : 314; Moolick, R.T. & J.J. Durek (1966), The Morenci district, in S.R. Titley and C.L. Hicks (editors), Geology of the porphyry copper deposits, southwestern North America, Univ. AZ Press, Tucson: 221-231. Anthony, J.W., et al (1995), Mineralogy of Arizona, 3rd.ed. : 314; Gilluly, J. (1937), Geology and ore deposits of the Ajo quadrangle, AZ, AZ Bur. of Mines Bull. 141. Thomas, W.J. & R.B. 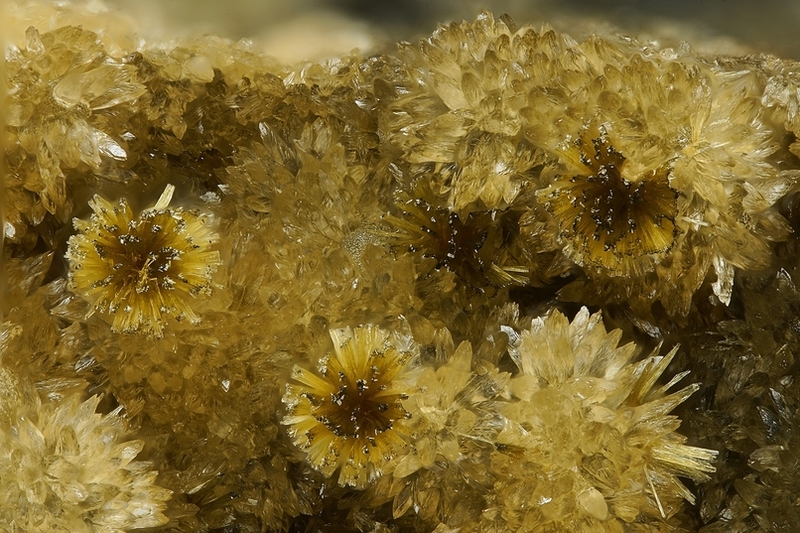 Gibbs (1983), Famous mineral localities: The New Cornelia mine, Ajo, AZ, Min.Rec. : 14: 283-298. Anthony, J.W., et al (1995), Mineralogy of Arizona, 3rd.ed. : 314; Schrader, F.C. & J.M. Hill (1915), Mineral deposits of the Santa Rita and Patagonia Mountains, AZ, USGS Bull. 582: 138; Galbraith, F.W. & D.J. Brennan (1959), Minerals of Arizona: 110. Anthony, J.W., et al (1995), Mineralogy of Arizona, 3rd.ed. : 315; Schwartz, G.M. (1952), Chlorite-calcite pseudomorphs after orthoclase phenocrysts, Ray, Arizona, Econ.Geol. : 47: 665-672; Jones, R.W. & W.E. Wilson (1983), The Ray mine, Min.Rec. : 14(5): 311-322. Anthony, J.W., et al (1995), Mineralogy of Arizona, 3rd.ed. : 315. Galbraith, F.W. & Brennan (1959), Minerals of AZ: 110. Jerry A. Baird photo of specimen now in Los Angeles Co. museum. ⓘ Kilpatrick and Adams Mine (Hardy-Walsh Brookite deposit) ? Murdoch, Joseph & Robert W. Webb (1966), Minerals of California, Centennial Volume (1866-1966): California Division Mines & Geology Bulletin 189: 280.
ⓘ Green Monster Mine ? Paul M. Adams (2003) Unusual vanadium minerals from the Green Monster Mine, Inyo County, California. Mineral News, 19, #8. Hess, Frank L. & Esper S. Larsen (1922), Contact-metamorphic tungsten deposits of the United States: USGS Bulletin 725: 266; Murdoch, Joseph & Robert W. Webb (1966), Minerals of California, Centennial Volume (1866-1966): California Division Mines & Geology Bulletin 189: 280. Hanks, Henry Garber (1886), Sixth report of the State Mineralogist: California Mining Bureau. Report 6 part 1, 145 pp. (includes catalog of minerals); […(abstract): Neues Jahrb., 1887, Band 2: 474]: 100; Murdoch, Joseph & Robert W. Webb (1966), Minerals of California, Centennial Volume (1866-1966): California Division Mines & Geology Bulletin 189: 280. Hamilton, Fletcher McNab (1922), eighteenth report of the State Mineralogist: California Mining Bureau. Report 18; 767 pp. : 129; Murdoch, Joseph & Robert W. Webb (1966), Minerals of California, Centennial Volume (1866-1966): California Division Mines & Geology Bulletin 189: 280. USGS (2005), Mineral Resources Data System (MRDS): U.S. Geological Survey, Reston, Virginia, loc. file ID #10040630.
ⓘ Black Rock Mine (Black Rock Tungsten deposit) ? Lemmon, Dwight Moulton (1941b), Tungsten deposits of the Benton Range, Mono County, California: USGS Bulletin 922-S: 590-591; Murdoch, Joseph & Robert W. Webb (1966), Minerals of California, Centennial Volume (1866-1966): California Division Mines & Geology Bulletin 189: 280. Hanks, Henry Garber (1886), Sixth report of the State Mineralogist: California Mining Bureau. Report 6 part 1, 145 pp. : 100; Murdoch, Joseph & Robert W. Webb (1966), Minerals of California, Centennial Volume (1866-1966): California Division Mines & Geology Bulletin 189: 280. Woodford, A.O., Crippen, R.A., and Garner, K.B. (1941) Section Across Commercial Quarry, Crestmore, California. American Mineralogist: 26: 366; Woodford, A.O. (1943), Crestmore minerals: California Division Mines Report 39: 352; Pemberton, H. Earl (1983), Minerals of California; Van Nostrand Reinholt Press: 440. Richmond, Gerald Martin (1939), Serendibite and associated minerals from the New City Quarry, Riverside, California: American Mineralogist: 24: 725-726; Pemberton, H. Earl (1983), Minerals of California; Van Nostrand Reinholt Press: 440. Schlocker, J. (1974) Geology of the San Francisco North quadrangle. USGS Professional Paper 782, 109 pp. : 63; Pemberton, H. Earl (1983), Minerals of California; Van Nostrand Reinholt Press: 441.
ⓘ Eagle Mine (Eagle-Hawk Mine Eagle and Hawk Claims) ? Fujishima, K.Y. and Fan, P-F (1977) Hydrothermal mineralogy of Keolu Hills, Oahu, Hawaii. American Mineralogist, 62, 574-582. Dunham, K.C. (1933) The American Mineralogist, 18, 369-385. Dunham, K.C. (1933) The American Mineralogist, 18, 384.
ⓘ Micro-Lite Quarry (Hills Pond Lamproite) ? ref. : Minerals of the Washington, D.C. Area. Leavitt, E. D., Spell, T. L., Goldstrand, P. M., & Arehart, G. B. (2004). Geochronology of the Midas low-sulfidation epithermal gold-silver deposit, Elko County, Nevada. Economic Geology, 99(8), 1665-1686. Whitmore & Lawrence, 2004. The Pegmatite Mines Known As Palermo, p.95. Nora K. Foley, Robert A. Ayuso, Joseph D. Ayotte, Denise L. Montgomery, and Gilpin R. Robinson, Jr. (2006): Geological Assessment of Cores from the Great Bay National Wildlife Refuge, New Hampshire (USGS Scientific Investigations Report 2006-5203). ⓘ Somerset Crushed Stone Co.
Frondel, C.: Minerals of Franklin and Sterling Hill, NJ - a checklist (1972): Dunn(1995):Pt4:486. Stewart, Walker, Wright and Fahey (1966), Physical Properties of Calcic Labradorite from Lake County Oregon, American Mineralogist, Vol. 51, 177-197. New Mexico Bureau of Mines and Mineral Resources, Mineral Museum no. 14929. James R. Wilson (1995) A Collector's Guide to Rock, Mineral, & Fossil Localities of Utah UGS Miscellaneous Publication 95-4; North, Jerry (2010) Displays of Nature : History, Minerals & Crystals of Utah's Bingham Canyon Copper Mine. ⓘ Cedar Mountain Stone Corp. Quarry (A. H. Smith quarry) ? Iizasa, K., Kawasaki, K., Maeda, K., Matsumoto, T., Saito, N., & Hirai, K. (1998). Hydrothermal sulfide-bearing Fe-Si oxyhydroxide deposits from the Coriolis Troughs, Vanuatu backarc, southwestern Pacific. Marine Geology, 145(1-2), 1-21. Oberthür, T., Melcher, F., Buchholz, P., & Locmelis, M. (2013). The oxidized ores of the Main Sulphide Zone, Great Dyke, Zimbabwe: turning resources into minable reserves-mineralogy is the key. Journal of the Southern African Institute of Mining and Metallurgy, 113(3), 00-00. Vivien Gornitz (2005) Mineral News, 21, #4, 1-11. Ehlmann, B.L., Mustard, J.F., Swayze, G.A., Clark, R.N., Bishop, J.L., Poulet, F., Des Marais, D.J., Roach, L.H., Milliken, R.E., Wray, J.J., Barnouin-Jha,O., Murchie, S.L. (2009) Identification of hydrated silicate minerals on Mars using MRO-CRISM: Geologic context near Nili Fossae and implications for aqueous alteration, Journal of Geophysical Research, 114, E00D08, 33 pages. doi:10.1029/2009JE003339.